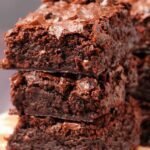 Vegan chocolate brownies that are ultra moist, mega chocolatey, dense, fudgy and everything a chocolate lover could dream of! Preheat the oven to 350°F (180°C). Spray a 9 x 9 inch square dish with non-stick spray and cut parchment paper so that the bottom of the dish is lined and there is overhang over the sides so you can easily lift out the whole tray of brownies when they’re baked. Set aside. Sift the flour and cocoa powder into a mixing bowl and add the brown and white sugar, baking powder, salt and instant coffee powder and mix together. Prepare your vegan buttermilk by adding 1 Tbsp of lemon juice to a measuring jug and then adding in soy milk up to the 1 cup (240ml) line. Allow it to curdle and then add to the mixing bowl. Add in the melted coconut oil and vanilla extract and stir it into a thick batter. Add the melted vegan chocolate and fold it into the batter. Add the chocolate chips and chunks and stir into the batter. The batter will be extremely thick. Spoon the batter out into the prepared baking dish and smooth down with the back of a spoon. Place extra chocolate chunks and chocolate chips on top. Place into the oven and bake for 30 minutes if you want them extremely gooey or 40 minutes if you want them super fudgy but not gooey. The brownies in the photos were baked for 40 minutes. When baked let them cool for around 15 minutes and then lift the whole tray of brownies out using the parchment paper overhang to lift out the whole tray. Place it onto a wire cooling rack and let it cool completely before cutting. If you cut the brownies when they are still quite warm, they will be harder to cut. To cut the brownies, heat up a knife by dipping it in some very hot water (from the kettle) and then drying it off with a towel and cutting. Then dip the knife again, dry it off and cut the next section and repeat until you have cut all the squares. This simultaneously allows you to cut perfect squares and makes the chocolate in the brownies all melty as you cut them. *Instant coffee powder can be omitted if you prefer, but it adds a little extra punch to the chocolate flavor. *Almond milk can also be used to make vegan buttermilk but soy milk is preferred because it creates a thicker/richer texture. *You can use chocolate chunks or chocolate chips or a mixture of both. I recommend a mixture of both for an extra layer of deliciousness. If you do half of each then this works out to around 88g of each.